4500 sq ft- 5 BR / 3BA Home with 180 Degree Pacific Ocean Views! 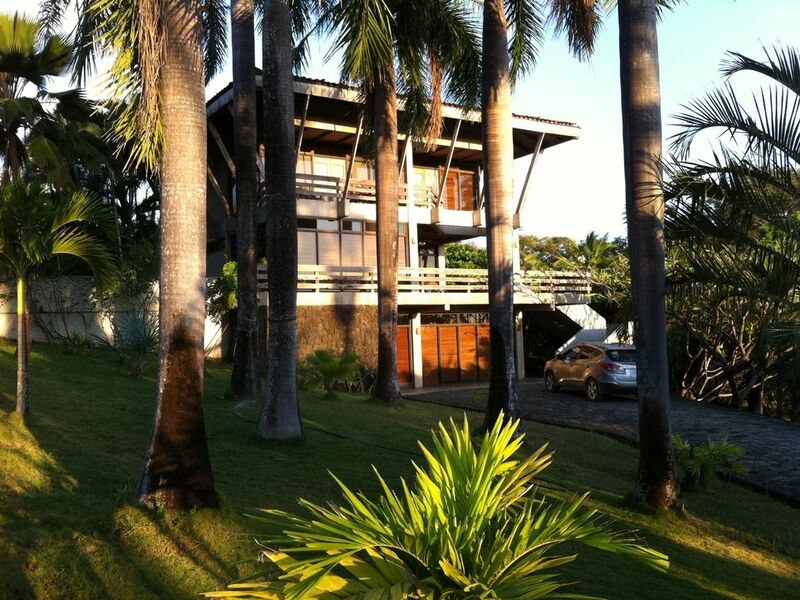 Villa Las Palmas Real, located on Playa Junquillal, Costa Rica, is situated on 6 acres of land only 150 meters from the beach. This 3 level 4500 sq ft villa enjoys spectacular 180 degree vistas of the Pacific Ocean from wrap around balconies. In a quiet private gated estate surrounded by palm trees, this is the ideal vacation spot for relaxing and getting away from it all. Our 5-bedroom villa is perfect for 2 - 4 couples traveling together, or as a romantic and extra-spacious getaway for 2. It will comfortably accommodate a family of twelve.There are three public beaches and a fresh water estuary within easy walking distance. There is a fabulous selection of restaurants in the area. During the day, you can see monkeys and a wide variety of birds near the house. At night, you can see Leatherback and Ridley Turtles nesting. Occasionally, you can see the spouts of Humpback whales from the deck. National Parks are a short drive. This custom vacation home was built to California standards. Villa las Palmas Real: is a privately owned villa located in a gated 6 1/2 acre private estate in beautiful Playa Junquillal (pronounced hoon-key-yal), a secluded and tranquil little village located in the Guanacaste region of Costa Rica. The tranquil gardens around the villa have over 30 different types of palm trees, 20 different heliconias, bougainvilla, fruit trees, flowering trees including frangiapani & the beautiful yellow roble. Fishing, swimming, snorkeling and surfing, tranquil, secluded beaches and incredible wildlife ensure a fantastic vacation with something for everyone in Playa Junquillal. Playa Junquillal: The village of Junquillal remains unspoiled and remote, a haven for those looking to spend their precious leisure time on the road less traveled. The village is home to only about 100 residents. Local Costa Ricans (Ticos) as well as international ex-pats welcome travelers with a warm hospitality seldom experienced in the whirlwind of the real world. Restaurants and more: Taste the local cuisine at one of the several restaurants within walking distance (about 1 mile) of the villa or create your own gourmet experience at home in the well appointed modern kitchen. The surrounding area also has a number of wonderful restaurants. Enjoy the spectacular sunsets over the ocean or the tranquil sunrises from the main floor patio or the upper balcony. Listen to howler monkeys in the trees. Watch the parrots chase each other across the large 6 1/2 acre estate or watch iguanas laze in the sun. It is a short 3 minute stroll to the secluded pristine beaches. There is everything to do, but you don't have to do anything. Our family fell in love with Playa Junquillal the first time we visted and we have been part of the community ever since. Playa Junquillal is a wonderful place to get away from it all. This tranquil setting has a 180 view of the ocean. We love the peaceful sunrises and sunsets from the balconies, the amazing number of stars at night and the sights and sounds of the ocean. The sounds of nature are all around - the parrots chasing each other across the lawn, the howler monkeys in the trees and the large zappos (frogs). There are two spacious master bedroom suites upstairs. One master bathroom has a combination bath tub/shower and the other has a large walk-in shower. Both have bidets and spa teak bath mats. The downstairs bathroom has a tempered glass shower, a wash hand basin and a toilet. All bathrooms are fully tiled and have Hansgrohe fittings. There is an outside shower with a spa teak mat to rinse off the sand after returning from the beach. 180 degree view of the ocean. Short 3 minute stroll to the ocean. There is a ceramic stove top and separate oven. The house is well equipped. There are every day dishes and dishes for special occasions. There is an elegant dining room with seating for eight. The amazing custom dining room table is made from one piece of Cenizero (a Costa Rican wood) and the chairs are made of leather and Cenizero. 6 1/2 acre gated estate. There is a fully equipped gourmet kitchen to U.S. standards. It has granite counter-tops, a stainless steel refrigerator, an oven, a ceramic cook-top, a microwave, dishwasher, disposal, several coffee makers, juicers, a blender, ice maker etc. There is an elegant dining room with seating for eight. The custom dining table is one piece of Cenizero that was designed by Jay Morrison and the matching chairs are made of black leather and Cenizero. There is a high chair. The living room has 2 armchairs & 2 sofas. These are also made of Cenizero and were made by Muebles Soto. The family room area has a desk, sofa and Franz leather chair and a custom designed wooden media center by Muebles Soto. There is a TV, a DVD player an ipod player. There is a large outside porch on the main level with 8 leather Costa Rican rocking chairs. On the side porch, there are 2 chairs to relax in the shade in the afternoons. There is also a large stainless steel gas grill. There are 3 public beaches within easy walking distance. Playa Venado which is directly in front of the house and about one-mile long is an easy 3- 4 min. walk. We enjoy walking to the estuary on this beach each morning and evening. There is also a rocky area that provides great rock pool exploration and small pools for playing. It is a great beach for swimming or surfing. Playa Honda about a 5 min. walk away, more of a cove than a beach is about 200 yds long. It is a great area for swimming. Playa Junquillal, abt 2 miles long is a 10-15 min walk. The beaches have won the coveted Bandera Azul Award for many years. There is an excellent selection of restaurants. There are monkeys and a wide variety of birds near the house. At night, you can see Leatherback and Ridley Turtles nesting. There is an active local turtle protection group that welcomes involvement. Occasionally, you can see the spouts of Humpback whales from the deck. Golfing and National Parks are a short drive.